JKCET 2019: Jammu & Kashmir Common Entrance Test is a state level entrance exam organized by Jammu & Kashmir Board of Professional Entrance Examinations once in a year for those who want to pursue in B.E / B. Tech. Permanent residents of J&K state are eligible for appearing in J&K Common Entrance Test JKCET 2019. Latest Update: JKCET 2019 Exam date Announced, Check the table below. Latest Update: JKCET 2019 last date of Application Submission Announced, Check the table below. JKCET is Engineering Entrance Test given by 12th appearing/appeared students to get admission in government and non-government engineering colleges of J&K state. JKCET 2019 will be conducted in Srinagar and Jammu cities. Every year J&K Board of Professional Entrance Examinations announces the date to fill the JKCET Application Form, last submission of the form, releasing date of admit card, examination date, and result date. Students can check actual dates from the notification provided by the official website of J&K state. Dates are not confirmed yet so you can take a look on Expected Dates of JKCET 2019. 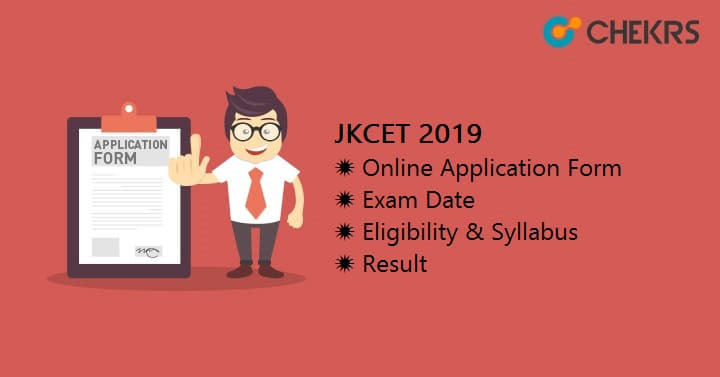 All those 12th appearing/appeared students of J&K state can fill JKCET Online Application Form of JKCET 2019 which will be released probably in the month of April 2019. The application form will be available on the official website of JKBOPEE. Eligible applicants can fill the form and pay the fee through online payment with the help of Net Banking/Credit Card or Debit Card. Visit on the official websites jakbopee.org or www.jkbopee.gov.in after the commencement of application form 2019. Register yourself on the site and it will generate an application number. With the help of generated application number& date of birth, applicants can login into the official website. Fill the form correctly and upload scanned images of photograph, signature & thumb impression. After completing this process, pay Rs.800/- as JKCET 2019 Application Fee using the payment gateway. NOTE:-Take the print out of filled application form or note the application number for future references. JKCET Eligibility Criteria will decide that are you eligible or not for the exam. So please read it carefully and then take a decision for appearing for the exam. Candidates should be a permanent resident of J&K state. Only 12th class appearing/appeared students can fill the application form. Candidates must have passed 12th or equivalent exam with minimum 50% marks with Physics, Chemistry and Mathematics as primary subjects. Minimum age should be 17 years on or before 31st December 2018. JKCET Syllabus is limited to 11th & 12th class Physics, Chemistry & Mathematics. CET 2019 paper contains questions related to the topic comes under CBSE or J&K state board syllabus. So candidates who are preparing for JKCET 2019 must go through the syllabus of Physics, Chemistry & Mathematics of class 11th and 12th. It is very important to know the JKCET 2019 Exam Pattern before appearing for the examination. Candidates must know how to attempt the paper, time duration, making the scheme. The examination may be conducted online or offline, it will be decided by the Board. There will be 180 multiple choice questions, 60 questions from each subject. Paper will be divided into 2 sections. Section A will contain 120 questions and Section B will contain 60 questions. 180 minutes will be provided to complete the entire paper. Total marks will be 180. Each question carry 1 Marks. For each question, 4 options will be given. Only one will be correct. JKCET Admit Card will release probably in the month of April 2019 in online mode. Candidates can download their admit card from the website of JKBOPEE by entering their application number on the given link of Download Admit Card. Click on the given link to download admit card. Enter the application number and date of birth to go to next page. After submitting these details, it will forward to the admit card. Take the printout of admit card and must carry at the time of examination. Without admit card applicants will be not allowed to enter in the exam hall. The examination authority of J&K state has released the answer key. You can download the JKCET Answer Key by clicking on the given link below. Check out the details regarding cut-off marks. JKCET 2019 Cut-off marks are set on the basis of different factors like a number of appearing applicants, highest score and difficulty level of exam & reservation system. JKBOPEE will declare JKCET Results on the official portal. JKBOPEE also provides answer key on the same day or next day of the exam. Candidates can match their answers and able to know how much marks they are obtaining. JKBOPEE announces the results in the month of May. Candidates can check their result and know their marks & secured rank. On the basis of marks or rank, applicants can get admission in government or non-government engineering colleges. JKCET counselling process will start after the release of result/merit list or cutoff marks in the month of May. Candidates have to download the call letter/ counseling letter from the official website. Candidates have to pay Rs.1200/- as counseling fee. Firstly, Candidates must register themselves for counselling. Then fill the option form for courses and colleges. Applicants can select the college as per their choice. On the basis of Seat Availability, Merit List, and Choice filling, the seat will be allotted to the Candidates.